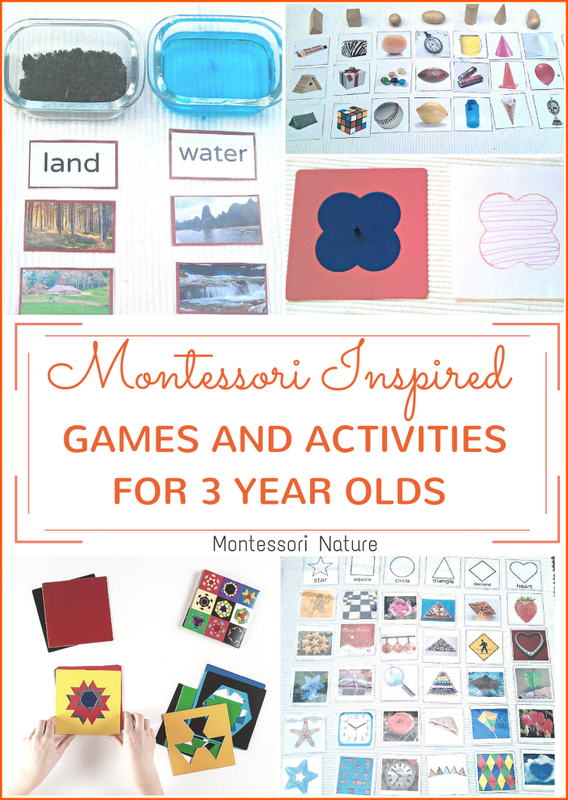 Montessori Inspired Activities and Games For 3-year-olds. 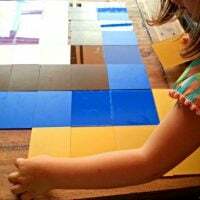 The Montessori method presents such an incredible amount of learning experiences for a child. These experiences are born from child’s natural desire to explore, curiosity and passion for the world. 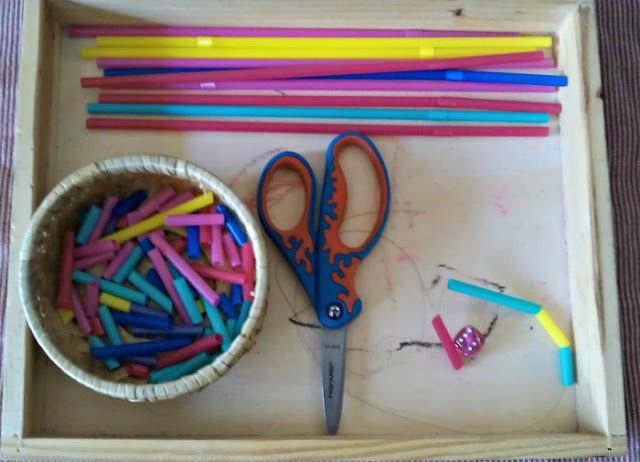 I am delighted to share with you what has been happening during our Montessori cycle at home – a classroom I set up for my three-year-old preschooler – A. 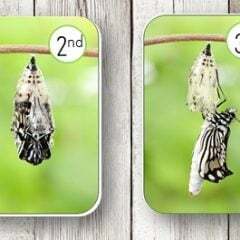 May I say that I have never felt so strongly about the benefits of the Montessori method until I started to implement it with my child at home. 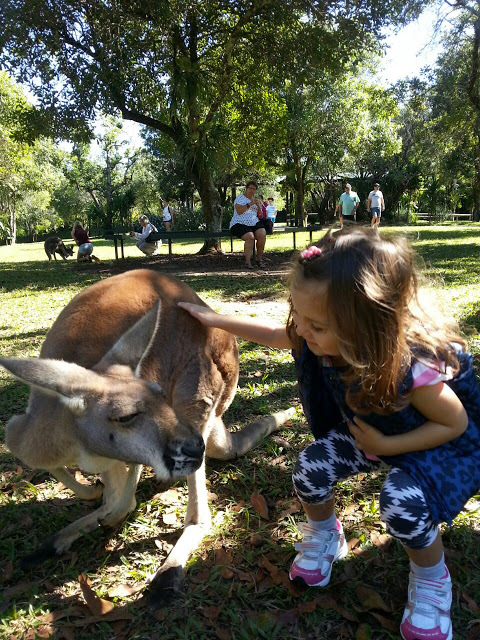 It is truly magical; it sees the child as a whole, it is incredibly versatile. One of the most satisfying aspects of it – it offers a set of areas, materials and methodology that genuinely bring results. 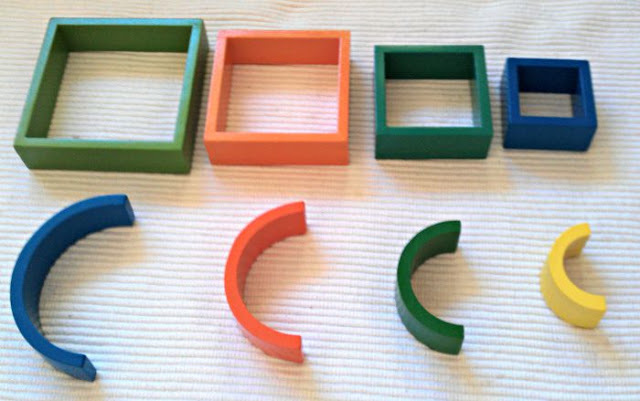 I love to watch my 3-year-old daughter get excited to learn about the geometric solids, and working with the Trinomial cube can be a highlight of her day. Can you sense a mild obsession with me? Well, here is what we have been learning recently..
Froebel (or push) pinning. I put together 24 pictures for pinning and happy to share them with you to save you some time. At this stage A uses a big pin which is very handy. It allows to apply more pressure and keep pinning precise on the line. It is an excellent challenge for a child which helps to strengthen their hand, improve fine motor, coordination and concentration. After A is finished we look together to make sure there are no spaces left between holes and separate picture from the rest of the paper which she glues it to a coloured piece of paper. Many prefer to print pictures for Froebel pinning on colour paper, to begin with. 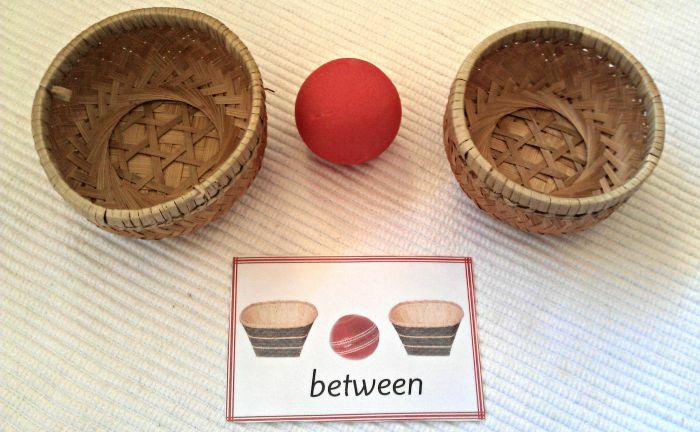 Sensorial – the Knobless Cylinders. 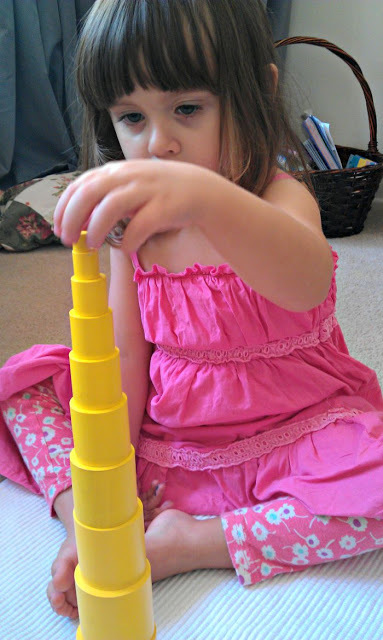 It is fascinating to see how accurate movements have to be to build a tower with knobless cylinders. We love coming up with different extensions, compare dimensions, measure and sort cylinders. We turned preposition activity into a game. After working with cards, baskets and a ball we give each other verbal instruction to place the ball in a different position in relation to the body: “place your ball behind your back”, “place the ball between your eyes”, etc. It is lots of fun. Sandpaper letters with initial sound cards. I created this set of cards. 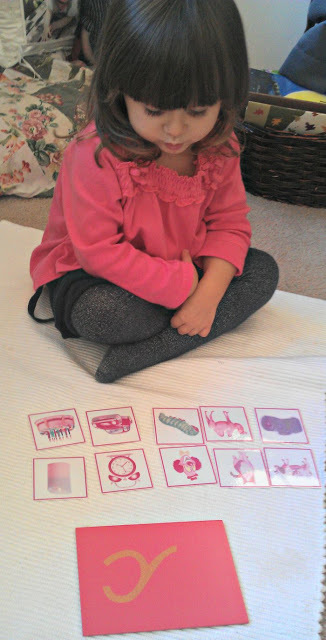 The cards help her to recognise initial sounds and are phonetically assorted. I enjoy teaching my daughter in a home setting which allows more time to learn letters, sounds, a number without rushing through them. 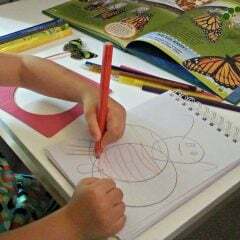 Tracing letters repetition creates visual and hand motion memory in her brain in preparation for writing. 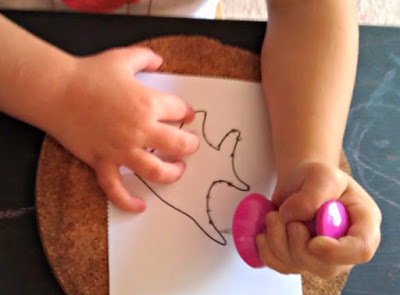 The metal inset activity with tracing shapes and drawing continues lines makes a solid preparation for cursive writing and encourages a child to apply strong pressure on the pencil. The sandpaper numbers are still in good use here. I prefer not to move further until I am confident A recognises her numbers 1-9 by heart. 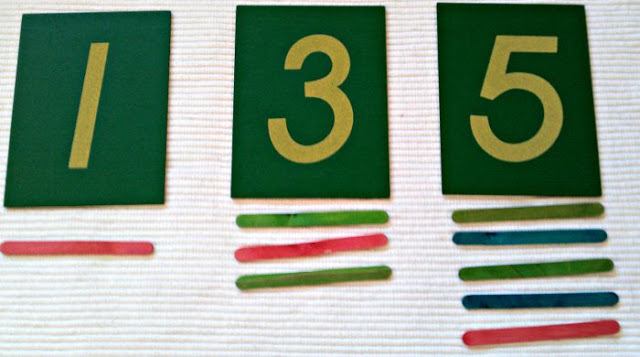 When doing 3-period lesson she claps to practice one-to-one correspondence or counts the matching amount of popsicle sticks. We use blocks to sort shapes. Land and Water activity is a fun discovery for A. 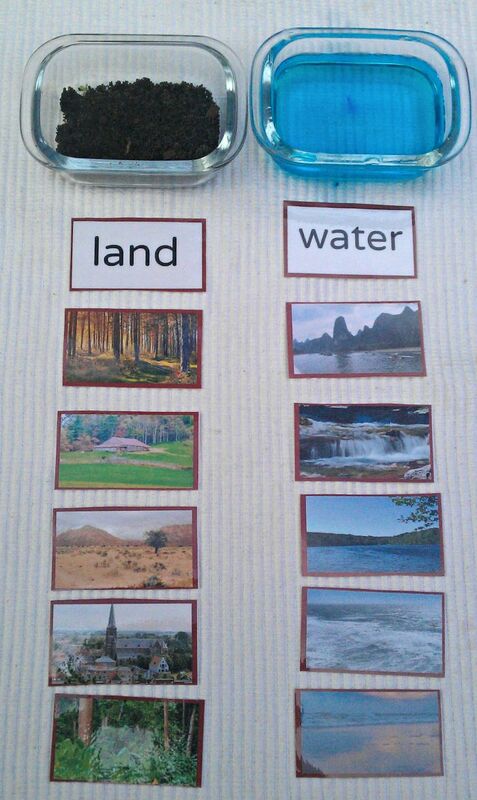 Using actual soil and water brought more solid meaning, and understanding and helped her to distinguish the difference when sorting cards better. Matching pictures to shapes. 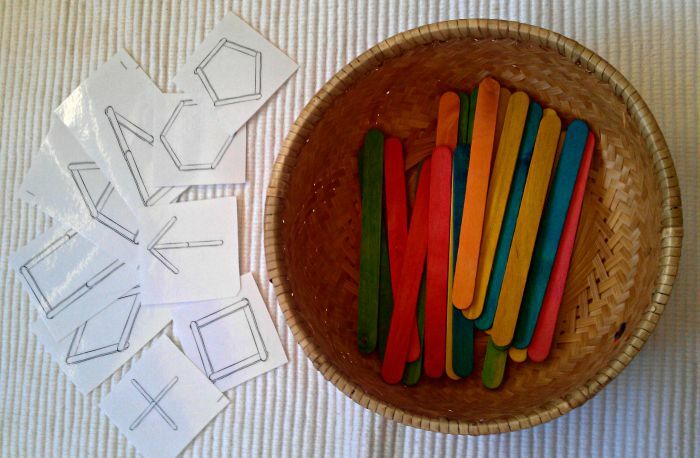 The shape sorting activity is a fun and attractive challenge for a three-year-old. This is a corresponding game with sticks – creating shapes by looking at a picture. You can download your free copy of printable here. It gives an opportunity for a child to practice problem-solving and logical thinking. The geometric solids. We have done 3-period lesson with shapes many times. Now A is working on recognising 3D shapes in her environment. Cards from Every Star Is Different are a great help! Learning to recognise emotions. 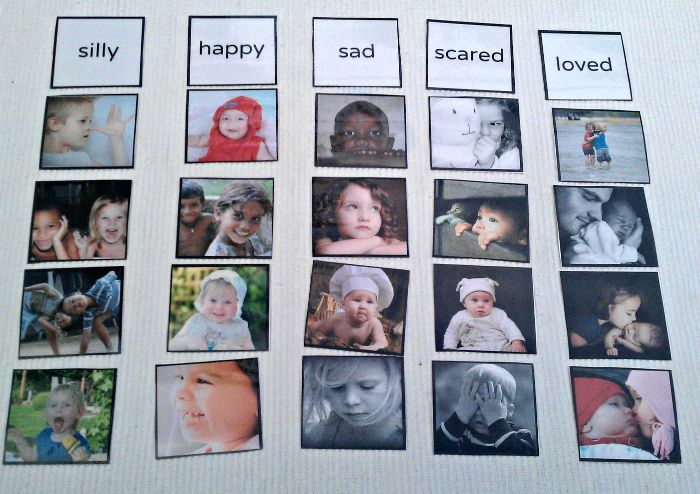 Using this activity A is learning to recognise different emotions and learn their names. It is helpful when she has a rough time (or happy time) for her to be able to identify and express what she feels at the moment and communicate her emotions to us. Cutting and threading. It was a great idea to put straw cutting on the shelf. A loved it, and later she could use cut pieces to make a necklace or sort them by colour. 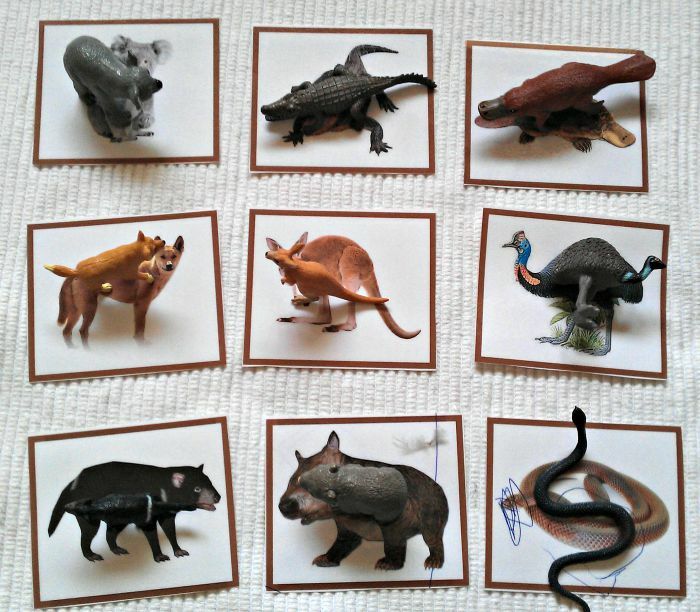 Learning Australian animals. 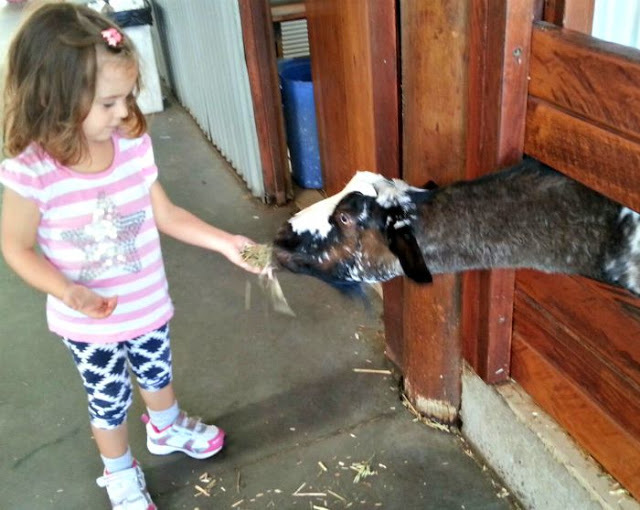 I especially like activities that incorporate objects, because I find it to be a perfect opportunity for engaging into the conversation, like talking about the animals, parts of their bodies, their habits, diets, etc. Creating hands-on, life experience is a huge part of what we do. Here is what on our “to do”list. Kaleidograph. “It can be arranged into over 570 billion patterns that mirror the natural geometry of crystals and flowers. 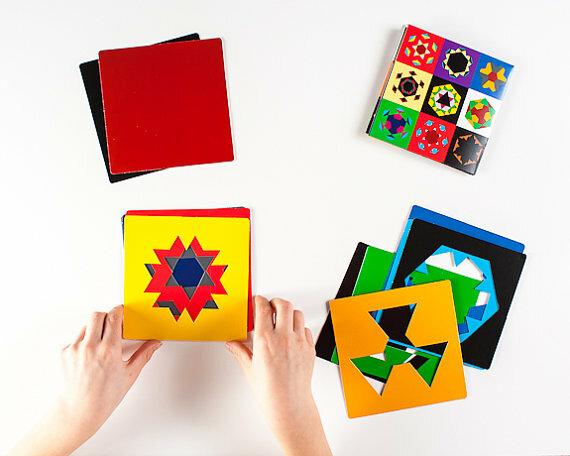 The Kaleidograph is part of the tradition of geometric pattern design toys from the original Froebel Kindergarten system”. I hope you can grab some ideas for your classroom or home. 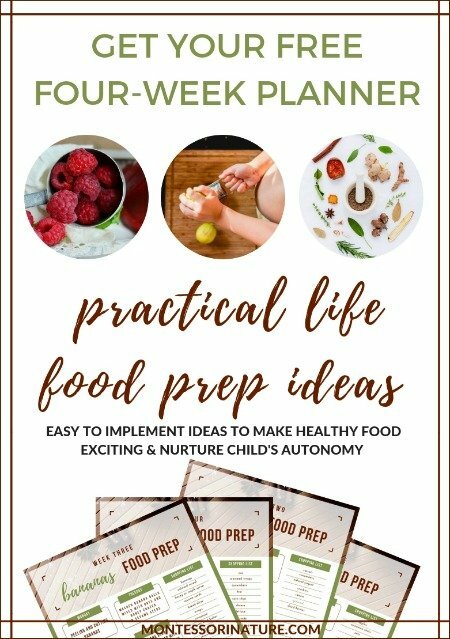 If you are interested in downloading any of printables mentioned in the post, click on links provided in descriptions. Some of them are free; some are paid. Links will take you to the printable page where you will be able to read more about them. Wow! You and your daughter have been busy! So many great activities! I love the sandpaper letter activity and how most of the cards have pink in them (or so it looks in the post). 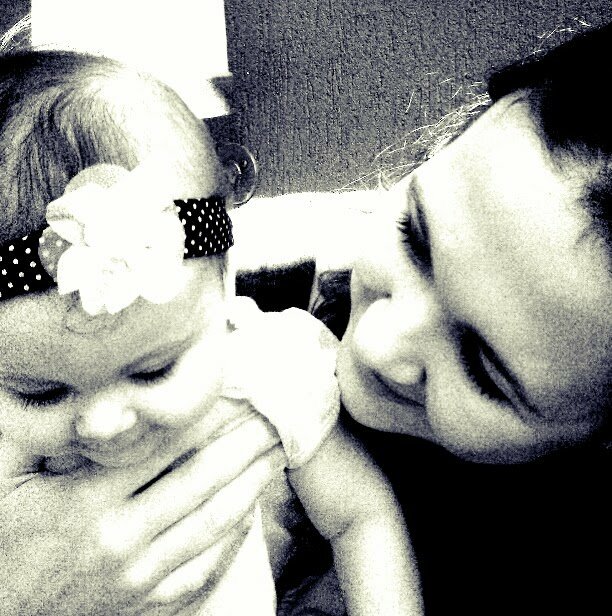 I can not believe how big your little girl is getting! She had lots of fun! These are wonderful! I love all of these activities! 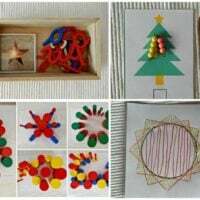 I'm going to place an order for some 'real' montessori materials soon (instead of all my diy-ing), and this post really gave me some nice inspiration! 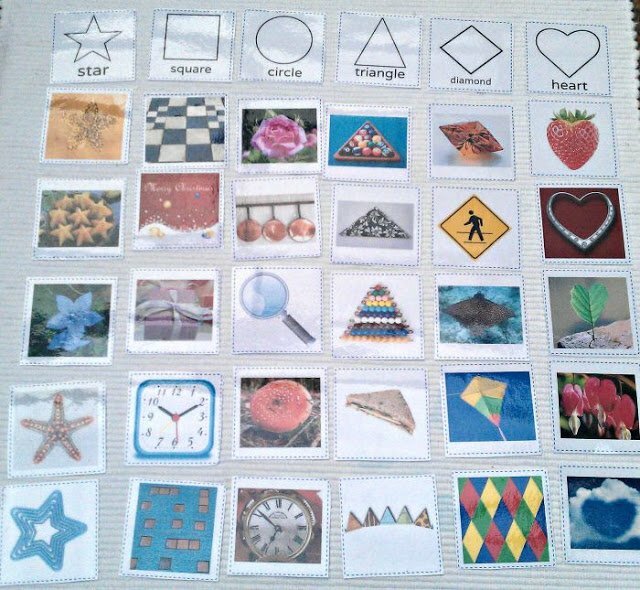 Thanks a lot for giving such useful information on Montessori Inspired Activities and Games!